Although I usually live and train in Sydney, I spend a fair amount of time in Adelaide. Which is where Iso comes in. Run by Head Coach Matt Jones (Brown Belt), in conjunction with the coaching staff; Nathan Semmens (Purple Belt), Lachlan Warne (Purple Belt), Tristan Macgillvray (Purple Belt), Kieran van Blyenburgh (Purple Belt) and Women's coach Sarah Jones (Blue Belt), ISO is a fabulous place to train. The first time I stepped onto the mat I was struck by the sense of family within the team, Isohealth has a very positive and welcoming environment. There's no ego just good, fun training. It doesn't matter what your goals are everybody is treated equal and all levels of students are given equal attention. Matt's knowledge and attention to detail makes Isohealth a great place to train. Along with Matt's excellent systematic and articulate approach to teaching and coaching, he also goes out of his way to organise world class BJJ instructors to deliver seminars here. When I first started going to Isohealth, I was the only woman in the regular class with the exception of Sarah. Now, many of the women I trained with in the women's only self defence class are training during the week, which is great to see. I can't wait to be back training with these guys. 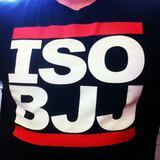 If you are thinking about starting a martial art, check out the team at Iso. If you are already a BJJ practitioner looking for somewhere to train when you are out of town, hit these guys up, you won't regret it.